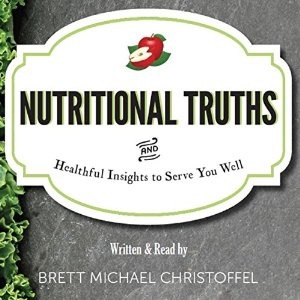 It is with much excitement that I announce that the audio version of Nutritional Truths is now available on iTunes, Audible, and Amazon. So however one likes to enjoy taking in a book they may do so now with mine. In fact you can listen to a two plus minute introduction HERE. The amount of time it took to record a forty thousand word book was less than 12 hours with the editing taking more time than that. I realized that a recording session could last up to two hours but after that my voice was toast so we did it over 6 days and it was a fun experience. I also soon learned that if you want to truly find each and every little typo and hidden glitch in a book you have written just record an audio version of it. Even after being professionally edited they existed, but that has now been rectified. With a finished listening time of four hours twenty-four minutes Nutritional Truths now lives forever in the land of Audio. As I begin work on my second book I am grateful to those who supported my efforts on the first. Especially those nine kind people who shared their stories of how they found solutions outside the norm to move beyond cancer. The entire reason I wrote the book was to support folks in avoiding illness and knowing that cut, burn, poison are not the only things to turn to if diagnosed with one of many “diseases”. Our bodies are designed to heal we simply have to get out-of-the-way sometimes and treat it in such a way that it can do its job. May your weekend bring you much joy and the gift of a good book of say like Nutritional Truths is priceless. Feel free to share and Be Well!